For a current list of cardinals, see List of living cardinals. The coat of arms of a cardinal is indicated by a red galero (wide-brimmed hat) with 15 tassels on each side (the motto and escutcheon are proper to the individual cardinal). A cardinal (Latin: Sanctae Romanae Ecclesiae cardinalis, literally 'cardinal of the Holy Roman Church') is a senior ecclesiastical leader, considered a Prince of the Church, and usually an ordained bishop of the Catholic Church. The cardinals of the Church are collectively known as the College of Cardinals. The duties of the cardinals include attending the meetings of the College and making themselves available individually or in groups to the pope as requested. Most have additional duties, such as leading a diocese or archdiocese or managing a department of the Roman Curia. A cardinal's primary duty is electing the pope when the see becomes vacant. During the sede vacante (the period between a pope's death or resignation and the election of his successor), the day-to-day governance of the Holy See is in the hands of the College of Cardinals. The right to enter the conclave of cardinals where the pope is elected is limited to those who have not reached the age of 80 years by the day the vacancy occurs. In 1059, the right of electing the pope was reserved to the principal clergy of Rome and the bishops of the seven suburbicarian sees. In the 12th century the practice of appointing ecclesiastics from outside Rome as cardinals began, with each of them assigned a church in Rome as his titular church or linked with one of the suburbicarian dioceses, while still being incardinated in a diocese other than that of Rome. The term cardinal at one time applied to any priest permanently assigned or incardinated to a church, or specifically to the senior priest of an important church, based on the Latin cardo (hinge), meaning "pivotal" as in "principal" or "chief". The term was applied in this sense as early as the ninth century to the priests of the tituli (parishes) of the diocese of Rome. There is disagreement about the origin of the term, but the consensus that "cardinalis" from the word cardo (meaning 'pivot' or 'hinge') was first used in late antiquity to designate a bishop or priest who was incorporated into a church for which he had not originally been ordained. In Rome the first persons to be called cardinals were the deacons of the seven regions of the city at the beginning of the 6th century, when the word began to mean "principal," "eminent," or "superior." The name was also given to the senior priest in each of the "title" churches (the parish churches) of Rome and to the bishops of the seven sees surrounding the city. By the 8th century the Roman cardinals constituted a privileged class among the Roman clergy. They took part in the administration of the church of Rome and in the papal liturgy. By decree of a synod of 769, only a cardinal was eligible to become bishop of Rome. Cardinals were granted the privilege of wearing the red hat by Pope Innocent IV in 1244. In cities other than Rome, the name cardinal began to be applied to certain church men as a mark of honour. The earliest example of this occurs in a letter sent by Pope Zacharias in 747 to Pippin III (the Short), ruler of the Franks, in which Zacharias applied the title to the priests of Paris to distinguish them from country clergy. This meaning of the word spread rapidly, and from the 9th century various episcopal cities had a special class among the clergy known as cardinals. The use of the title was reserved for the cardinals of Rome in 1567 by Pius V.
In the year 1563 the influential Ecumenical Council of Trent, headed by Pope Pius IV, wrote about the importance of selecting good Cardinals. According to this historic council "nothing is more necessary to the Church of God than that the holy Roman pontiff apply that solicitude which by the duty of his office he owes the universal Church in a very special way by associating with himself as cardinals the most select persons only, and appoint to each church most eminently upright and competent shepherds; and this the more so, because our Lord Jesus Christ will require at his hands the blood of the sheep of Christ that perish through the evil government of shepherds who are negligent and forgetful of their office." The earlier influence of temporal rulers, notably the French kings, reasserted itself through the influence of cardinals of certain nationalities or politically significant movements. Traditions even developed entitling certain monarchs, including those of Austria, Spain, and France, to nominate one of their trusted clerical subjects to be created cardinal, a so-called crown-cardinal. In early modern times, cardinals often had important roles in secular affairs. In some cases, they took on powerful positions in government. In Henry VIII's England, his chief minister was Cardinal Wolsey. Cardinal Richelieu's power was so great that he was for many years effectively the ruler of France. Richelieu's successor was also a cardinal, Jules Mazarin. Guillaume Dubois and André-Hercule de Fleury complete the list of the four great cardinals to have ruled France. In Portugal, due to a succession crisis, one cardinal, Henry, King of Portugal, was crowned king, the only example of a cardinal-king. While the incumbents of some sees are regularly made cardinals, and some countries are entitled to at least one cardinal by concordate (usually earning either its primate or the metropolitan of the capital city the cardinal's hat), no see carries an actual right to the cardinalate, not even if its bishop is a Patriarch. In 1059, Pope Nicholas II gave cardinals the right to elect the bishop of Rome in the papal bull In nomine Domini. For a time this power was assigned exclusively to the cardinal bishops, but in 1179 the Third Lateran Council restored the right to the whole body of cardinals. In 1586 Pope Sixtus V limited the number of cardinals to 70: six cardinal bishops, 50 cardinal priests, and 14 cardinal deacons. Pope John XXIII exceeded that limit citing the need to staff Church offices. In November 1970 in Ingravescentem aetatem, Pope Paul VI established that electors would be under the age of eighty years. When it took effect on 1 January 1971, it deprived twenty-five cardinals of the right to participate in a conclave. In October 1975 in Romano Pontifici eligendo, he set the maximum number of electors at 120, while establishing no limit on the overall size of the College. Pope Paul VI also increased the number of cardinal bishops by assigning that rank, in 1965, to patriarchs of the Eastern Catholic Churches when named cardinals.. In 2018, Pope Francis expanded the cardinal bishops of Roman title, because this had not been done despite recent decades' expansion in the two lower orders of cardinals, besides having all 6 such cardinals being over the age limit for a conclave. Each cardinal takes on a titular church, either a church in the city of Rome or one of the suburbicarian sees. The only exception is for patriarchs of Eastern Catholic Churches. Nevertheless, cardinals possess no power of governance nor are they to intervene in any way in matters which pertain to the administration of goods, discipline, or the service of their titular churches. They are allowed to celebrate Mass and hear confessions and lead visits and pilgrimages to their titular churches, in coordination with the staff of the church. They often support their churches monetarily, and many Cardinals do keep in contact with the pastoral staffs of their titular churches. The Dean of the College of Cardinals in addition to such a titular church also receives the titular bishopric of Ostia, the primary suburbicarian see. Cardinals governing a particular Church retain that church. In accordance with tradition, they sign by placing the title "Cardinal" (abbreviated Card.) after their personal name and before their surname as, for instance, "John Card(inal) Doe" or, in Latin, "Ioannes Card(inalis) Cognomen". Some writers, such as James-Charles Noonan, hold that, in the case of cardinals, the form used for signatures should be used also when referring to them in English. Official sources such as the Catholic News Service say that the correct form for referring to a cardinal in English is normally as "Cardinal [First name] [Surname]". This is the rule given also in stylebooks not associated with the Catholic Church. This style is also generally followed on the websites of the Holy See and episcopal conferences. Oriental Patriarchs who are created Cardinals customarily use "Sanctae Ecclesiae Cardinalis" as their full title, probably because they do not belong to the Roman clergy. In Latin, the [First name] Cardinal [Surname] order is used in the proclamation of the election of a new pope by the cardinal protodeacon,[e] if the new pope is a cardinal, as he has been since 1378. Choir dress of a cardinal. Cardinal bishops (cardinals of the episcopal order) are among the most senior prelates of the Catholic Church. Though in modern times most cardinals are also bishops, the term "cardinal bishop" only refers to the cardinals who are titular bishops of one of the seven suburbicarian sees. In early times, the privilege of papal election was not reserved to the cardinals, and for centuries the person elected was customarily a Roman priest and never a bishop from elsewhere. To preserve apostolic succession the rite of consecrating him a bishop had to be performed by someone who was already a bishop. The rule remains that, if the person elected Pope is not yet a bishop, he is consecrated by the Dean of the College of Cardinals, the Cardinal Bishop of Ostia. There are seven suburbicarian sees: Ostia, Albano, Porto and Santa Rufina, Palestrina, Sabina and Mentana, Frascati, and Velletri. Velletri was united with Ostia from 1150 until 1914, when Pope Pius X separated them again, but decreed that whichever cardinal bishop became Dean of the College of Cardinals would keep the suburbicarian see he already held, adding to it that of Ostia, with the result that there continued to be only six cardinal bishops. Since 1962, the cardinal bishops have only a titular relationship with the suburbicarian sees, with no powers of governance over them. Each see has its own bishop, with the exception of Ostia, of which the Cardinal Vicar of the see of Rome serves as apostolic administrator. The current cardinal bishops of the suburbicarian dioceses are given in the table below (along with those cardinals whose titular churches were co-opted to suburbicarian rank in June 2018). Those over 80 years of age are ineligible to participate in a Papal conclave. For a period ending in the mid-20th century, long-serving cardinal priests were entitled to fill vacancies that arose among the cardinal bishops, just as cardinal deacons of ten years' standing are still entitled to become cardinal priests. Since then, cardinals have been advanced to cardinal bishop exclusively by papal appointment. Those appointed to be cardinal-bishops are usually already cardinals, but their seniority within the order of cardinal bishops is determined by the date of their elevation to the order of cardinal bishop, rather than by the date they originally became cardinals of a lesser order. On June 26, 2018, it was announced that, corresponding to the expansion in cardinal priests and cardinal deacons in recent decades, there would be an expansion in cardinal bishops (of Roman titles). Four cardinals, effective June 28, were elevated to this rank by having their titular churches co-opted to suburbicarian rank. At the time of the announcement, all six cardinal bishops of suburbicarian see titles, as well as two of the three cardinal patriarchs, were non-electors because of having reached age 80. The Dean of the College of Cardinals, or Cardinal Dean, is the primus inter pares of the College of Cardinals, elected by the Latin Church cardinal bishops from among their own number, an election, however, that must be approved by the Pope. The position of Dean formerly belonged by right to the longest-serving of the cardinal bishops. The Vice-Dean is similarly elected by the Latin Church cardinal bishops from among their own number with the Pope's approval and also formerly belonged by right to the second-longest-serving of the cardinal bishops. In 1965, Pope Paul VI decreed in his motu proprio Ad Purpuratorum Patrum Collegium that patriarchs of the Eastern Catholic Churches who were named cardinals (i.e., patriarch cardinals) would also be cardinal bishops, ranking after the six cardinal bishops of the suburbicarian sees. Unlike all other cardinals, these patriarch cardinals do not receive any title associated with the Diocese of Rome. Unlike the other cardinal bishops, they do not participate in electing the dean nor can they be chosen dean. If a Latin Church prelate who carries the title patriarch, such as that of Venice or Lisbon, becomes a cardinal, he ranks as a cardinal priest, not automatically as a cardinal bishop, unless specifically appointed as one. Cardinal priests are the most numerous of the three orders of cardinals in the Catholic Church, ranking above the cardinal deacons and below the cardinal bishops. Those who are named cardinal priests today are generally bishops of important dioceses throughout the world, though some hold Curial positions. In modern times, the name "cardinal priest" is interpreted as meaning a cardinal who is of the order of priests. Originally, however, this referred to certain key priests of important churches of the Diocese of Rome, who were recognized as the cardinal priests, the important priests chosen by the pope to advise him in his duties as Bishop of Rome (the Latin cardo means "hinge"). Certain clerics in many dioceses at the time, not just that of Rome, were said to be the key personnel—the term gradually became exclusive to Rome to indicate those entrusted with electing the bishop of Rome, the pope. While the cardinalate has long been expanded beyond the Roman pastoral clergy and Roman Curia, every cardinal priest has a titular church in Rome, though they may be bishops or archbishops elsewhere, just as cardinal bishops were given one of the suburbicarian dioceses around Rome. Pope Paul VI abolished all administrative rights cardinals had with regard to their titular churches, though the cardinal's name and coat of arms are still posted in the church, and they are expected to celebrate mass and preach there if convenient when they are in Rome. While the number of cardinals was small from the times of the Roman Empire to the Renaissance, and frequently smaller than the number of recognized churches entitled to a cardinal priest, in the 16th century the College expanded markedly. In 1587, Pope Sixtus V sought to arrest this growth by fixing the maximum size of the College at 70, including 50 cardinal priests, about twice the historical number. This limit was respected until 1958, and the list of titular churches modified only on rare occasions, generally when a building fell into disrepair. When Pope John XXIII abolished the limit, he began to add new churches to the list, which Popes Paul VI and John Paul II continued to do. Today there are close to 150 titular churches, out of over 300 churches in Rome. The cardinal who is the longest-serving member of the order of cardinal priests is titled cardinal protopriest. He had certain ceremonial duties in the conclave that have effectively ceased because he would generally have already reached age 80, at which cardinals are barred from the conclave. The current cardinal protopriest is Michael Michai Kitbunchu of Thailand. The cardinal deacons are the lowest-ranking cardinals. Cardinals elevated to the diaconal order are either officials of the Roman Curia or priests elevated after their 80th birthday. Bishops with diocesan responsibilities, however, are created cardinal priests. Cardinal deacons derive originally from the seven deacons in the Papal Household and the seven deacons who supervised the Church's works in the districts of Rome during the early Middle Ages, when church administration was effectively the government of Rome and provided all social services. Cardinal deacons are given title to one of these deaconries. Cardinals elevated to the diaconal order are mainly officials of the Roman Curia holding various posts in the church administration. Their number and influence has varied through the years. While historically predominantly Italian the group has become much more internationally diverse in later years. While in 1939 about half were Italian by 1994 the number was reduced to one third. Their influence in the election of the Pope has been considered important, they are better informed and connected than the dislocated cardinals but their level of unity has been varied. Under the 1587 decree of Pope Sixtus V, which fixed the maximum size of the College of Cardinals, there were 14 cardinal deacons. Later the number increased. As late as 1939 almost half of the cardinals were members of the curia. Pius XII reduced this percentage to 24 percent. John XXIII brought it back up to 37 percent but Paul VI brought it down to 27 percent where John Paul II maintained this ratio. As of 2005, there were over 50 churches recognized as cardinalatial deaconries, though there were only 30 cardinals of the order of deacons. Cardinal deacons have long enjoyed the right to "opt for the order of cardinal priests" (optazione) after they have been cardinal deacons for 10 years. They may on such elevation take a vacant "title" (a church allotted to a cardinal priest as the church in Rome with which he is associated) or their diaconal church may be temporarily elevated to a cardinal priest's "title" for that occasion. When elevated to cardinal priests, they take their precedence according to the day they were first made cardinal deacons (thus ranking above cardinal priests who were elevated to the college after them, regardless of order). When not celebrating Mass but still serving a liturgical function, such as the semiannual Urbi et Orbi papal blessing, some Papal Masses and some events at Ecumenical Councils, cardinal deacons can be recognized by the dalmatics they would don with the simple white mitre (so called mitra simplex). The cardinal protodeacon is the senior cardinal deacon in order of appointment to the College of Cardinals. If he is a cardinal elector and participates in a conclave, he announces a new pope's election and name[f] from the central balcony of St. Peter's Basilica in Vatican City. The proto-deacon also bestows the pallium on the new pope and crowns him with the papal tiara, though coronations have been discontinued since Pope John Paul I opted for a simpler papal inauguration ceremony in 1978. The current cardinal proto-deacon is Renato Raffaele Martino. The Cardinal Camerlengo of the Holy Roman Church, assisted by the Vice-Camerlengo and the other prelates of the office known as the Apostolic Camera, has functions that in essence are limited to a period of sede vacante of the papacy. He is to collate information about the financial situation of all administrations dependent on the Holy See and present the results to the College of Cardinals, as they gather for the papal conclave. Reginald Pole was a cardinal for 18 years before he was ordained a priest. Until 1917, it was possible for someone who was not a priest, but only in minor orders, to become a cardinal (see "lay cardinals", below), but they were enrolled only in the order of cardinal deacons. For example, in the 16th century, Reginald Pole was a cardinal for 18 years before he was ordained a priest. In 1917 it was established that all cardinals, even cardinal deacons, had to be priests, and, in 1962, Pope John XXIII set the norm that all cardinals be ordained as bishops, even if they are only priests at the time of appointment. As a consequence of these two changes, canon 351 of the 1983 Code of Canon Law requires that a cardinal be at least in the order of priesthood at his appointment, and that those who are not already bishops must receive episcopal consecration. Several cardinals aged over 80 or close to it when appointed have obtained dispensation from the rule of having to be a bishop. [g] These were all appointed cardinal-deacons, but Roberto Tucci and Albert Vanhoye lived long enough to exercise the right of option and be promoted to the rank of cardinal-priest. A cardinal who is not a bishop is still entitled to wear and use the episcopal vestments and other pontificalia (episcopal regalia: mitre, crozier, zucchetto, pectoral cross and ring). Even if not a bishop, any cardinal has both actual and honorary precedence over non-cardinal patriarchs, as well as the archbishops and bishops who are not cardinals, but he cannot perform the functions reserved solely to bishops, such as ordination. The prominent priests who since 1962 were not ordained bishops on their elevation to the cardinalate were over the age of 80 or near to it, and so no cardinal who was not a bishop has participated in recent papal conclaves. At various times, there have been cardinals who had only received first tonsure and minor orders but not yet been ordained as deacons or priests. Though clerics, they were inaccurately called "lay cardinals". Teodolfo Mertel was among the last of the lay cardinals. When he died in 1899 he was the last surviving cardinal who was not at least ordained a priest. With the revision of the Code of Canon Law promulgated in 1917 by Pope Benedict XV, only those who are already priests or bishops may be appointed cardinals. Since the time of Pope John XXIII a priest who is appointed a cardinal must be consecrated a bishop, unless he obtains a dispensation. Cardinal Sarr with a ferraiolo, and wearing a red cassock, but not the rest of the choir dress. Cardinals Walter Kasper (left) and Godfried Danneels (right) wearing their choir dress: scarlet (red) cassock, white rochet trimmed with lace, scarlet mozetta, scarlet biretta (over the usual scarlet zucchetto), and pectoral cross on cord. 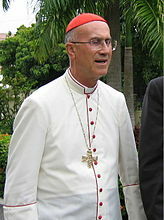 Cardinal Lacroix wearing the ordinary dress of a cardinal: black cassock with scarlet (red) piping and buttons, scarlet fascia (sash), pectoral cross on a chain, and a scarlet zucchetto. Cardinal Bertone in dress for hot tropical countries (white cassock with scarlet piping and buttons). When in choir dress, a Latin Church cardinal wears scarlet garments—the blood-like red symbolizes a cardinal's willingness to die for his faith. 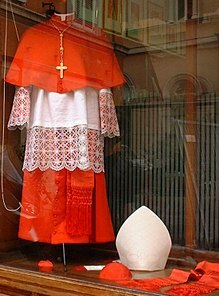 Excluding the rochet—which is always white—the scarlet garments include the cassock, mozzetta, and biretta (over the usual scarlet zucchetto). The biretta of a cardinal is distinctive not merely for its scarlet color, but also for the fact that it does not have a pompon or tassel on the top as do the birettas of other prelates. 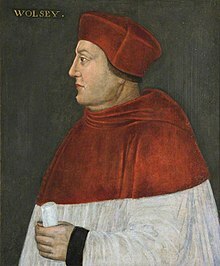 Until the 1460s, it was customary for cardinals to wear a violet or blue cape unless granted the privilege of wearing red when acting on papal business. His normal-wear cassock is black but has scarlet piping and a scarlet fascia (sash). Occasionally, a cardinal wears a scarlet ferraiolo which is a cape worn over the shoulders, tied at the neck in a bow by narrow strips of cloth in the front, without any 'trim' or piping on it. It is because of the scarlet color of cardinals' vesture that the bird of the same name has become known as such. Eastern Catholic cardinals continue to wear the normal dress appropriate to their liturgical tradition, though some may line their cassocks with scarlet and wear scarlet fascias, or in some cases, wear Eastern-style cassocks entirely of scarlet. In previous times, at the consistory at which the pope named a new cardinal, he would bestow upon him a distinctive wide-brimmed hat called a galero. This custom was discontinued in 1969 and the investiture now takes place with the scarlet biretta. In ecclesiastical heraldry, however, the scarlet galero is still displayed on the cardinal's coat of arms. Cardinals had the right to display the galero in their cathedral, and when a cardinal died, it would be suspended from the ceiling above his tomb. Some cardinals will still have a galero made, even though it is not officially part of their apparel. To symbolize their bond with the papacy, the pope gives each newly appointed cardinal a gold ring, which is traditionally kissed by Catholics when greeting a cardinal (as with a bishop's episcopal ring). Before the new uniformity imposed by John Paul II, each cardinal was given a ring, the central piece of which was a gem, usually a sapphire, with the pope's stemma engraved on the inside. There is now no gemstone, and the pope chooses the image on the outside: under Pope Benedict XVI it was a modern depiction of the crucifixion of Jesus, with Mary and John to each side. The ring includes the pope's coat of arms on the inside. Cardinals have in canon law a "privilege of forum" (i.e., exemption from being judged by ecclesiastical tribunals of ordinary rank): only the pope is competent to judge them in matters subject to ecclesiastical jurisdiction (cases that refer to matters that are spiritual or linked with the spiritual, or with regard to infringement of ecclesiastical laws and whatever contains an element of sin, where culpability must be determined and the appropriate ecclesiastical penalty imposed). The pope either decides the case himself or delegates the decision to a tribunal, usually one of the tribunals or congregations of the Roman Curia. Without such delegation, no ecclesiastical court, even the Roman Rota, is competent to judge a canon law case against a cardinal. ^ The rule set out in Universi Dominici gregis is that "No Cardinal elector can be excluded from active or passive voice in the election of the Supreme Pontiff, for any reason or pretext." ^ They were formerly called illustrissimi and reverendissimi; but Pope Urban VIII (of the Barberini family), in 1630, established the above as their title of honour. Edward Wigglesworth, Thomas Gamaliel Bradford: Encyclopædia Americana: a popular dictionary of arts, sciences. Volume 4. Page 493. 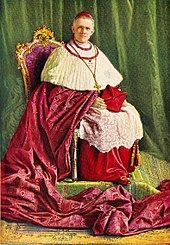 ^ As the exclusive electors of the pope (at least since 1179), cardinals were deemed to be the ecclesiastical equivalents of the Holy Roman Empire's 'Prince-Electors,' an extremely elite group with precedence over all other nobility (including archdukes, dukes and counts), who were tasked with the responsibility of electing Holy Roman Emperors.... A decree of 10 June 1630, by Urban VII bestowed the title "His Eminence", historically reserved for high nobility, upon the cardinals, thus elevating them above the 'His Excellency,' then being used to refer to Italian princes." Guruge, Anura. The Next Pope. Alton, New Hampshire. 2010. Page 81. ^ Examples include Domenico Bartolucci, Karl Josef Becker, Yves Congar, Aloys Grillmeier, Henri de Lubac, Julien Ries, Leo Scheffczyk, Roberto Tucci and Albert Vanhoye. ^ The three were: Ignatius Kung Pin-Mei, Bishop of Shanghai, made cardinal 1979, revealed 1991; Marian Jaworski, Archbishop of Lviv, made cardinal 1998, revealed 2001; Jānis Pujāts, Archbishop of Riga, made cardinal 1998, revealed 2001. John Paul created a fourth in 2003 but did not reveal his identity, not even in his will. Speculation centered on Joseph Zen Ze-kiun, Bishop of Hong Kong, Tadeusz Kondrusiewicz, Archbishop of Moscow, and Archbishop Stanisław Dziwisz, John Paul's longtime friend and secretary. ^ a b c Sägmüller, Johannes Baptist (1913). "Cardinal" . In Herbermann, Charles (ed.). Catholic Encyclopedia. New York: Robert Appleton Company. ^ Catholic bishops and Pope Pius IV (11 November 1563). The Council of Trent. Tan Books and Publishers. ^ a b Chadwick, Owen (1981). The Popes and European Revolution. Oxford University Press. p. 266. ISBN 9780198269199. ^ Henry Kitchell Webster, Hutton Webster, Early European History, p. 604. Retrieved from https://books.google.com/books?id=rXSqwPFMn3oC. ^ Fanning, W. (1911). "Papal Elections". The Catholic Encyclopaedia. Robert Appleton Company. ISBN 0840731752. ^ Cortesi, Arnaldo (18 November 2017). "Two Americans among 23 New Cardinals" (PDF). New York Times. Retrieved 25 October 2017. ^ Cortesi, Arnoldo (16 December 1958). "Pope Elevates 33 to Cardinalate; Deplores China Church Schism" (PDF). New York Times. Retrieved 25 October 2017. ^ Hoffman, Paul (24 November 1970). "Voting for Popes Is Barred to Cardinals Over 80". New York Times. Retrieved 30 October 2017. ^ Reese, Thomas J. (1998). Inside the Vatican: The Politics and Organization of the Catholic Church. Harvard University Press. p. 101. ISBN 9780674418028. ^ Mickens, Robert (24 April 2017). "Letter from Rome The Next Stage of Francis's Mission". Commonwealth Magazine. Retrieved 9 July 2017. ^ Stanley, Alexandra (22 February 2001). "Shaping a Legacy, Pope Installs 44 Cardinals". New York Times. Retrieved 1 September 2016. ^ Allen Jr., John L. (2002). Conclave: The Politics, Personalities, and Process of the Next Papal Election. Random House. p. 107. ISBN 9780385504560. Most canon lawyers take the opinion that the pope, in appointing more electors than anticipated by Universi Dominici Gregis, made an exception to his own rules and hence all the cardinals under eighty, regardless of the limit of 120, are eligible to enter the conclave. (Canon lawyers ruefully joke that nobody violates canon law like a pope.) As a political matter, it seems probable that all cardinals under eighty will be admitted regardless of the wording of Universi Dominici Gregis because the task of trying to decide who cannot enter could paralyze the process indefinitely. ^ "Pontiff Installs 27 New Cardinals" (PDF). New York Times. 23 February 1965. Retrieved 26 October 2017. ^ "Catholic News Service" (PDF). www.catholicnews.com. Archived from the original (PDF) on 12 December 2005. ^ "University of San Francisco Editorial Style Guide: "On first reference capitalize these titles before the individual's name: Cardinal Timothy Manning, archbishop of Los Angeles"" (PDF). Archived from the original (PDF) on 4 December 2014. ^ "Associated Press Style Guide: "The preferred form for first reference is ... Cardinal Daniel DiNardo"" (PDF). ^ The websites of the Holy See (except for signatures), and of the Episcopal Conferences in the United States, England and Wales Archived 20 August 2008 at the Wayback Machine, Ireland Archived 24 July 2008 at the Wayback Machine and the Australia Archived 20 July 2008 at the Wayback Machine agree with the stylebooks. The Bishops' Conference of Scotland Archived 11 May 2008 at the Wayback Machine uses both styles side by side. On diocesan sites, the "John Cardinal Doe" style is found on, for example, those of Boston, Chicago, Dublin, New York Archived 3 July 2008 at the Wayback Machine, Toronto, Washington Archived 1 April 2007 at the Wayback Machine, Galveston-Houston Archived 24 November 2010 at the Wayback Machine, Detroit, Durban Archived 19 February 2008 at the Wayback Machine, Colombo, Bombay, and the "Cardinal John Doe" on, for example, those of Armagh,Los Angeles Archived 29 October 2007 at the Wayback Machine, Philadelphia Archived 17 May 2008 at the Wayback Machine, St Andrews and Edinburgh Archived 7 September 2008 at the Wayback Machine, Wellington, Westminster. ^ "Election - BENEDICT XVI". www.vatican.va. ^ "History of Papal Electoral Law". www.ewtn.com. ^ Pope John XXIII (9 April 1962). "Suburbicariis sedibus" (in Latin). Libreria Editrice Vaticana. Retrieved 2 November 2017. ^ "Rescriptum of the Holy Father Francis ..." Holy See Press Office. 26 June 2018. Retrieved 26 June 2018. ^ Glatz, Carol (26 June 2018). "New papal appointments reflect pope's wish for transparency". National Catholic Reporter. Catholic News Service. Retrieved 26 June 2018. ^ Pope Paul VI (11 February 1965). "Ad Purpuratorum Patrum Collegium" (in Latin). Libreria Editrice Vaticana. Retrieved 3 December 2017. ^ Scaramuzzi, Jacopo (12 June 2014). "Martino diventa cardinale protodiacono (senza "Habemus Papam")". La Stampa (in Italian). Retrieved 23 January 2018. ^ "Pastor Bonus, - John Paul II - Apostolic Constitution (June 28, 1988) - John Paul II". www.vatican.va. ^ Rickaby, John (1913). Catholic Encyclopedia. 3. p. 337. ^ Boudreau, Richard (7 April 2005). "Mystery Cardinal Will Never Be Able to Join Peers". Los Angeles Times. Retrieved 6 July 2018. ^ Applause and tears in Basilica greet Pontiff (26 November 2007) Belfast Telegraph. Retrieved 1 June 2008. Quote: "In a ceremony televised across the world cardinal-elect Sean Brady knelt before Pope Benedict XVI and pledged his allegiance to the Church before receiving his special red birretta—a symbol of a cardinal's dignity and willingness to shed blood for the increase of the Christian faith." ^ a b "Instruction on the dress, titles and coat-of-arms of cardinals, bishops and lesser prelates". L'Osservatore Romano, English ed. 17 April 1969: vol.4. Retrieved 1 September 2006. 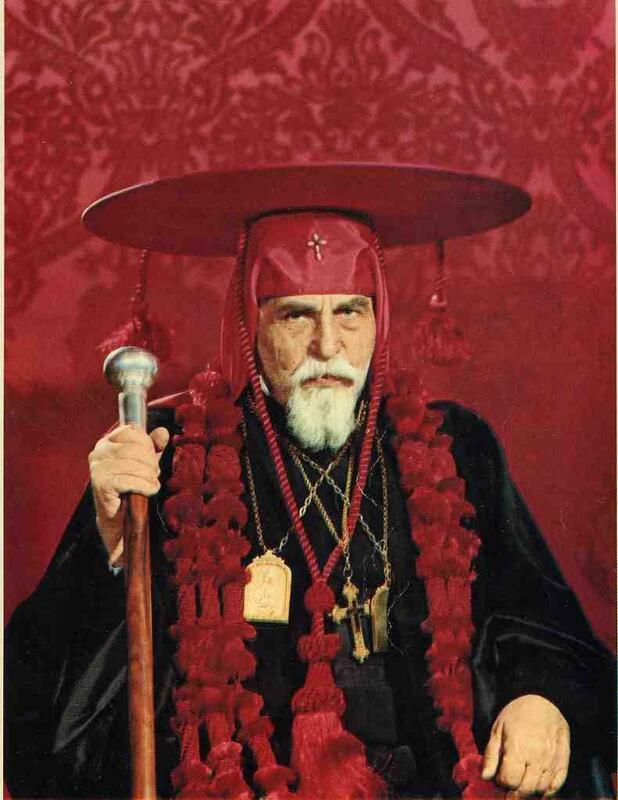 ^ Photograph of Josyf Slipyj, Major Archbishop of the Ukrainian Catholic Church and Cardinal, wearing a galero on top of his red klobuk. Retrieved from http://photos1.blogger.com/blogger/6322/78/1600/SlypyjGalero1.jpg. ^ Paulson, Michael (25 March 2006). "Bling! examination of the ring of Cardinal O'Malley". Boston Globe. Retrieved 8 September 2010. ^ John Abel Nainfa (1909). Costume of Prelates of the Catholic Church: According to Roman Etiquette. Baltimore-New York: John Murphy Company. p. 107. . The new cardinal had to pay for the ring, in exchange for which he received the right to make his own Last Will and Testament. ^ "Elevated cardinals receive gold ring from the pope during Mass of Rings". www.fogcityjournal.com. Retrieved 20 February 2018. Battandier, Albert (1913). "Ecclesiastical Addresses" . In Herbermann, Charles (ed.). Catholic Encyclopedia. New York: Robert Appleton Company. Noonan, Jr., James-Charles (1996). The Church Visible: The Ceremonial Life and Protocol of the Roman Catholic Church. Viking. ISBN 0-670-86745-4. Sägmüller, Johannes Baptist (1913). "Cardinal" . In Herbermann, Charles (ed.). Catholic Encyclopedia. New York: Robert Appleton Company. Boudinhon, Auguste (1911). "Cardinal" . In Chisholm, Hugh (ed.). Encyclopædia Britannica (11th ed.). Cambridge University Press. Wikimedia Commons has media related to Category:Cardinals. Next Cardinal Creating Consistory by Pope Benedict XVI -- The Required Background Data (including statistical data and links). Popes and the Papacy website (Anura Guruge). Retrieved 2010-09-08. This page was last edited on 12 April 2019, at 10:12 (UTC).